Busy? Who isn’t these days? As a busy mother of four young kiddos I know how handy it is to have something to snack on that provides an energy boost, tastes good, and can be eaten with one hand. It would be slightly embarrassing to tell you how many times I have dropped food on my baby’s head while nursing him or carrying him in the Ergo. There may or may not have been a ramen incident last fall. 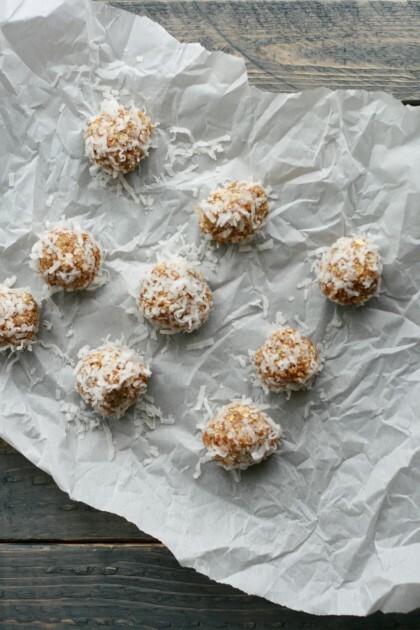 These Coconut Energy Bites can be enjoyed without incident. They are easy enough to eat with one hand while you’re busy snuggling a wee baby with the other. No baby? No worries just grab two energy bites â one for each hand! These (lime) zesty and coconut bites are filled with lime zest, lime juice, and rolled in coconut. They pack the perfect tropical punch. A bonus is they also contain rolled oats which are good for nursing mamas. What’s not to love? Congratulations Zainab & Mr. J! Here is a list of other bloggers honoring Zainab with a ton of mouthwatering sweet & savory tropical themed recipes. Stop over and say “hi”. If your dates are a little dry soak them in water for 10 minutes. Drain before adding to the food processor. Certified gluten free oats can be subbed for the regular oats. What a great idea for a healthy tropical treat! It took me a while to figure out how to maneuver eating and nursing but luckily I got it! These are the perfect snack time treat! I love energy bites! They are perfect for on-the go in between school and work. 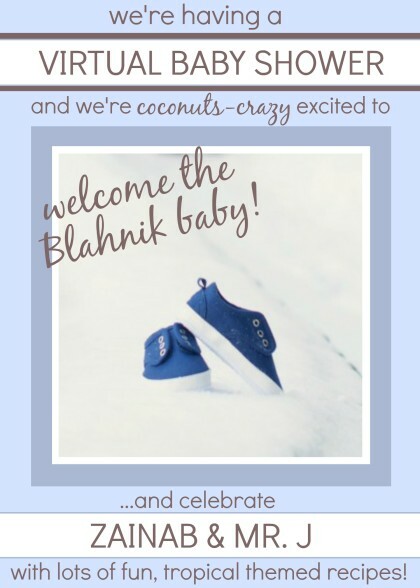 I’m loving all these coconut ideas for Zainab! These sound delicious! I bet they would be great with gluten-free oats too! Oh, these are perfect to snack on! I think I’ll make them today! 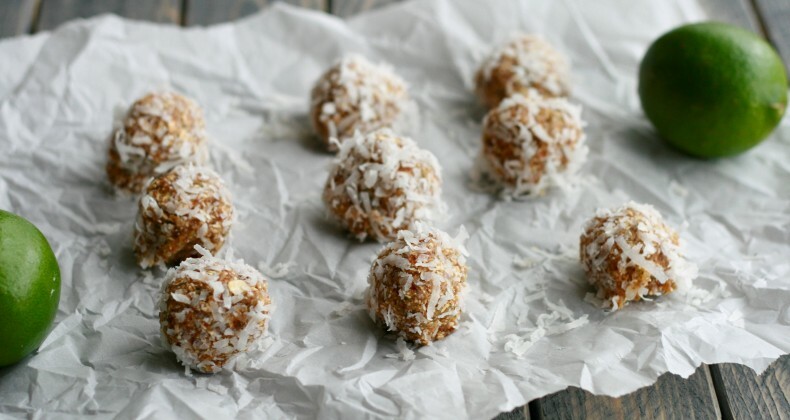 These energy bites are the perfect snack to keep those energy levels up! Love the lime in here too! These are perfect for Zainab! So glad we can celebrate her and her growing family today. And I got a laugh out of your dropping food on your babies head! I can just picture it! Wow what a simple ingredient list, I love it! These are so fun and so perfect for a new mommy! I definitely remember those days of dropping crumbs on my babies’ heads :/ Zainab definitely won’t have that problem if she’s got a batch of these in her fridge. Thank you so much for being a part of her baby shower today! I love that you recipe is totally Zainab and completely functional for her as a new mother! I’ll be grabbing two in each hand for the time being because these look so tasty! I have every bars/bites on hand in my house all the time and am always looking for new flavors! I have to try this one! Yay for no bake in this heat! I snack on energy bites all the time at work! These coconut ones are perfect!